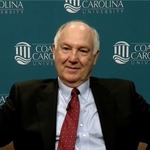 Son of JK East, designated founder of Coastal Carolina College, Ken East, Jr. discusses his father's accomplishments in South Carolina education and his devotion to establishing higher education in Horry County. East, Jr. recounts his father's character and determination to improve all levels of education for all South Carolinians. East, J. Ken Jr. and Tomczyk, Charmaine B., "J. Ken East, Jr., oral history interview" (2018). The Coastal Carolina University Oral History Project. 3.